Outsourcing DNS can be a smart move for companies searching for increased website availability and security. But not all DNS management providers are created equal. 100% network uptime is the SLA you want. If customers can’t reach your website, they’re not your customers. Insist on highly redundant nodes. Non-open source resolvers are less prone to malware, viruses and phishing. Insist on a provider with built-in DDoS protection, as well as failover to a DDoS protection network. Plus, support for DNS security extension (DNSSEC) guards against cache poisoning and pharming attacks. Fast query resolutions are essential, yes. But also make sure your provider minimizes dropped requests. More points of global presence mean much faster service for queries bound for servers in Shanghai, Bonn or Boston. It’s key to sustained growth. Simple traffic routing services for monitored load balancing and failover are a must for everyone. To further optimize traffic, seek out advanced services which provide the flexibility to direct and customize network traffic for enhanced performance without the need for costly hardware investments. A sophisticated platform doesn’t help if it’s hard to use. Be sure you like the portal. It should be simple to access, let you make changes easily, and deliver clear, useful reporting. A simpler word for these is reputation. How long has Provider A been managing DNS? How deep is their expertise, both in technical knowledge and customer support? It pays to check with peers and evaluate their experiences. 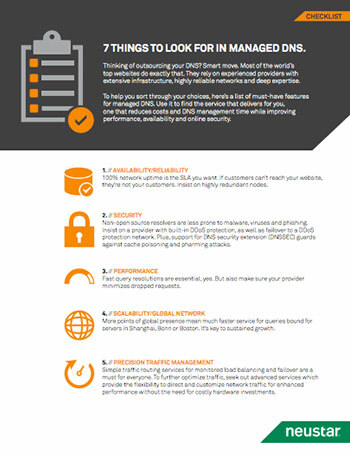 Download the checklist and read why these 7 features are critical to your DNS outsourcing strategy.